Bono and the Edge wrote the music for the upcoming Broadway production "SPIDER-MAN Turn Off the Dark," and a new song previewed from the production Friday sounds like it could be part of the U2 catalog. But the musical's director, Julie Taymor, says the pair drew from many different genres to create a sound that is more than a typical rock concert. "They have gone way beyond what I thought any rock musicians would do because they're really serious storytellers and they get it, and they get the world of music that they can draw from. They're not frightened of it," Taymor said. "It's not like they have to put their U2 stamp on everything. There's real orchestral, ballads and ancient music and it's just drawn from many sources to support the story. It's amazing." Bono and the Edge previewed the song "Boy Falls From the Sky" from "SPIDER-MAN" on ABC's "Good Morning America" via satellite while on tour. The song was performed by the rock band Carney at the Hudson Theatre; its lead singer, Reeve Carney, stars in the musical as Spider-man and the rest of his band is part of the musical as well. "I'm so honored that Bono thought that I could sing songs that he wrote," said Carney afterward. The musical based on the superhero has been in the works at least seven years. Though it had delays and other setbacks, Taymor said the idea that it has been a tortured road to Broadway has been overblown. "People made more of that than it was. It stopped, but we all had things to do and our heart was still with this project," said Taymor, whose vision brought the Tony-award winning "Lion King" to Broadway. "Now I've got a fabulous cast, unbelievable people on the technical side, and it's mind boggling because it's so ambitious, but we believe the material supports the ambition. It's a beautiful story." 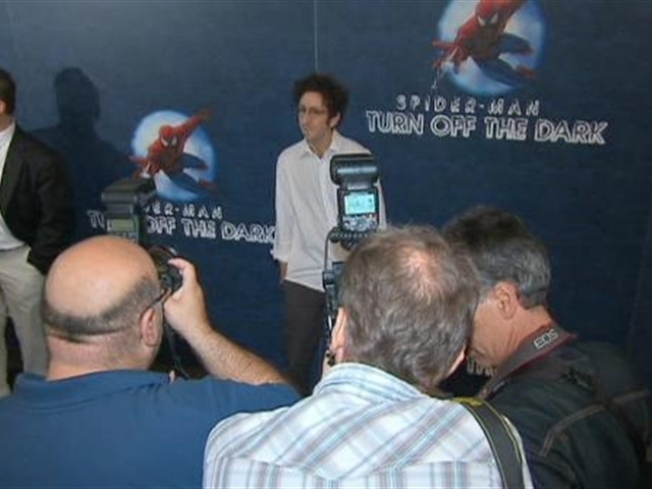 Taymor said the story of this Spider-man is different than what many grew up reading in comic books, including a love triangle involving Spider-man's alter-ego Peter Parker's girlfriend, Mary Jane: "There are many familiar things that people will know, but on the other hand, we're bringing a new angle. "Bono and Edge were ... very integral to the creation of these characters and the story because the songs have to deliver the story." The musical is set to open on Broadway in late December. Taymor said it's the most ambitious project she's done and promises never-before-tried theatrics, including battle scenes that will take place over the audience and in the balcony, and cyber-villians for a mix of theater and film. But she said the special effects do not overshadow the plot. "I'm not there to just do circus or do visual effects for their own sake," she said. Although there are a wealth of comic-book characters from which to base a musical on, Taymor said she chose Spider-man because he's someone everyone can identify with. "He is the everyman, he's the boy from Queens, the high school kid, who gets bitten by a genetically altered spider and now has to contend with how to keep his life on balance," she said. "That's very different form the other ones, where they're just fighting evil and battling evil and they've got everything given to him."